Any excuse I have to use mason jars and patterned straws provides for a really good day in my life. It’s the little things in life that make me smile. My life is not this sad. I just like bright, colorful props and crafts. ;) I go crazy (absolutely frantic) over patterned straws, and usually stock up when Pick Your Plum decides to sell them for 75% off. Pick Your Plum will eventually ruin me. I promise you this. If you’ve never visited this delightful little website, do yourself a favor, and don’t do it (or do it — it’s up to you). You will get addicted. Hey, I forewarned you. A year will go by, and you will have so many unnecessary little goodies stocked up in your craft space, you won’t even know what to do with yourself. Bright pink tutus anyone?! When will I ever use these!? So anyway, this is a blog post about smoothies, not Pick Your Plum. This might just be my favorite smoothie thus far. 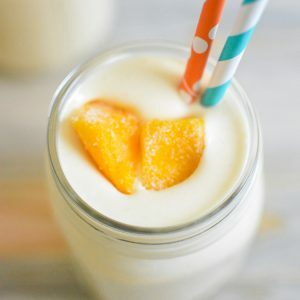 It’s a play on peaches and cream, but with mango substituted in for the peaches. It’s also “skinnified.” That’s a big bonus. I love it for a post run snack (mostly because of the Greek yogurt addition). You’ll love it. I know you will. No beer pairing today, guys. It just didn’t seem right. Also, mason jars are mandatory. Also, also, patterned straws are also mandatory — they may even be more mandatory than the mason jars, but that is debatable. In the pitcher of your blender, add the banana, frozen mango chunks, vanilla Greek yogurt, almond milk and mango nectar or juice. Blend on high speed for 1 minute, or longer, until smooth and creamy. Adjust the ingredient amounts based on preference. For example, if you like a thinner smoothie, thin the mixture out with more milk or mango nectar. If you like a thicker smoothie, add the other half of the banana. Serve immediately, or serve in airtight mason jars for a couple of days (which is how I like to store them). Enjoy! I want this smoothie!! Oh yeah!!! Haha, thanks Jocelyn! I could go for one right now, too!